Nominated for Best Foreign Language Film (Canada, Kim Nguyen). This year’s thought provoking war film comes from Canada, but they leave their polite compassion at the door in bringing War Witch to the screen. Komona (Rachel Mwanza) is a young African girl whose small village is attacked by the rebel army. She is forced to kill her parents and then follow the rest of the kids she has grown up with into a war of the jungle. They are handed heavy assault rifles and drink “magic milk” (which is probably high in alcohol content, among other things) before going to fight. When Komona sees what she calls ghosts who communicate the hidden location of those they are fighting against, her leaders take notice and she is promoted to the status of War Witch. This is less of a privilege and more of a very precarious position–war witches don’t last long. Their job is to keep their group safe so that they win. Back at camp, the girls are sexualized objects among the men. Knowing this, the Magicien (Serge Kanyinda), an albino who creates talismans, has fallen in love with the leader’s War Witch and after drinking the magic milk, he convinces her to run away with him and get married. She tells him what her father always said–that if he wants to marry her he has to bring her a white rooster, which according the film is incredibly rare and hard to find. They hide out at Magicien’s uncle’s house, and in perhaps an interesting twist, the uncle’s name is The Butcher (Ralph Prosper) and he is the kindest character in the film. Not willing to lose his War Witch, the Grand Tigre Royal (Mizinga Mwinga) who leads the rebel army, comes after her. It is not long after that Komona finds herself pregnant and still haunted by ghosts–specifically the ghosts of her dead parents. In an attempt to finally put the ghosts to rest, Komona must do something drastic for both herself and her baby. The film is not just about the reality behind child soldiers in Africa, but it is more deeply about family and loneliness. In a very powerful scene, Komona gives birth alone, at the side of a river, and rises above it. She shows strength beyond her fourteen years, but that is because the loss of her family and her circumstances have forced her to grow up too quickly. She shoulders more burdens than even the men who would claim her, and yet she still comes out on top. Her parents, as is evidenced very clearly, are always with her and she carries that guilt every day. She knows she could die any day, but she is not willing to stop fighting for herself and for her family. Despite the content, the filming style is very still for most of the film. It shows Komona’s world in a very frank, matter of fact way. It becomes chaotic when they consume the magic milk, but otherwise we become accustomed to small people caring big guns and fighting for their lives. We get to see a glimpse into the horror of child soldiers kidnapped from their homes, but we also see the hope and the love that others are still willing to offer despite what human beings are capable of doing to one another. War Witch was not my favorite film. It is surprisingly slow, despite having a phenomenal story. It is about Komona and her experiences and we see very little of what the other kids experience. In that way, the story was very narrow, but that is perhaps because so much happens to her that other side stories would become too heavy for the narrative. I got a little bored while watching it, but I found the ghosts property creepy, I bit my nails a lot, and was stunned when Komona gave birth to a healthy baby at the side of a river and then continued to paddle down stream like nothing had even happened. I can’t really place my finger on what I disliked. It was slow, and quiet, and perhaps too calm for what was happening. It is an intense film, and for that reason I do not recommend it for everyone. If my review, or the trailer piques your interest, then by all means you should see the film. Nominated for Best Director (Michael Heneke), Best Actress (Emmanuelle Riva), Best Original Screenplay (Michael Haneke), and Best Picture (Margaret Menegoz, Stefan Arndt, Velt Heiduschka, Michael Katz). Won Best Foreign Language Film (Michael Haneke). 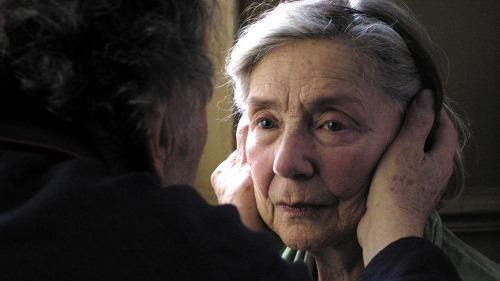 Amour is a heavy, well crafted tale of the tests that love goes through in the last days of our lives. Georges (Jean-Louis Trintignant) and Anne (Emmanuelle Riva) have been married a long time. Well cultured and now retired music teachers, they lead simple lives in a beautiful french apartment full of books and a baby grand. One morning, Anne has a lapse, which we assume was probably a stroke, because the next time we see her she has undergone surgery, and it went badly. She slowly progresses from being half paralyzed in a wheelchair to being bed ridden and cared for my nurses and husband alike. Georges bears most of his wife’s condition very well, although you can see the sadness, fear, and helplessness in his eyes. His daughter, who seems very preoccupied with her own life, keeps insisting that something must be done, but Georges has the ability to see that there isn’t much that can be done but help Anne be comfortable. Anne loses her ability to communicate in the end, but although her words make no sense, you can see every emotion plainly in her eyes. This is one of those films where I forgot pretty quickly that I was watching a foreign film. I hardly noticed I was reading subtitles most of the time. It is somewhat slow moving, particularly in the stillness that director Michael Haneke uses effectively. He chose to shoot several scenes in one shot. The camera doesn’t move for several minutes while Georges cuts flowers, Anne learns to use her wheelchair, or receives a bath from a nurse. There is so much communication in this film, and most of it isn’t through dialogue. The cinematography is brilliant, the story telling is wonderful, and the emotions are heart breaking. It is easy to connect with the characters, which is sometimes difficult in foreign films. Almost the entire film is shot in their small apartment and yet we see a whole life story. Georges and Anne are still individuals who are learning about one another, and though the truth is that we all die alone, Georges is with Anne every step of the way, with love that only he could show to her. Although the film is hard to watch, I also found the story quiet beautiful. Those of us who are lucky to make it to their age with our partner will one day experience this, and it isn’t any easier than if they had lost each other earlier in their lives. The story is relatable, but it is also an example of the partnership in marriage. This film will require a little patience, and should probably not be viewed if you are having a tough time in life, but besides that I would highly recommend it. Nominated for Best Foreign Language Film (Agnieszka Holland). In Darkness is a film about the Holocaust, but more specifically about humanity in the face of adversity. Based on true events, it causes us to relive a nasty part of history that should never stop being retold. Nazi Germany had reached its way into Poland. A sewer worker, Mr. Socha (Robert Wiechiewicz) stumbles across a group of Jews from the ghetto preparing for the inevitable and makes a deal with them for when the time comes. He is driven by greed and promises his partner that if it gets too hairy they will just hand the Jews in and walk away with the money. Socha helps smuggle the Jews into the sewer and finds a suitable hiding place for them, where they hide for over a year. Socha finds himself immediately under scrutiny by wife, shop owners, and suspicious Nazis. Instead of running, however, he realizes that the eleven people in the sewer are human beings with families who deserve to breathe fresh air just as much as the next man. The film is dark and slow moving. Everyone is always tense and fearful. There are storms and flooding, Nazi sewer searches, babies, and murder. As much as the Jews want to trust Socha, they keep him at arms length and jump to conclusions. He is only there for the money, after all. I loved the character arch of Socha. He is certainly the standout actor who holds most of the screen time. We see his home life, his work life, and his night life. We see the fear in his eyes when he must help the Nazis search the sewers and we watch as his cares become less about money and more about life. He is willing to lose everything, and in doing so teaches those around him an important lesson. As far as holocaust films go, In Darkness is less about the war camps and more about the struggle these particular families went through. It shows quite clearly that although the Jews received the worst of it, everyone was affected by Hitler and Nazi Germany. Although the film moves slowly, it keeps you on the edge of your seat. Every second I was sure that their hiding place would be found or that Mr. Socha would fail them. I would definitely recommend In Darkness. I thought it was a particularly well made and understandable foreign film. The characters grab at your heart and the story keeps your attention. I may never view it again, but it is exquisite enough to make a lasting memory. Nominated for 2 awards, of which it won 1. Nominated for Best Original Screenplay (Asghar Farhadi). Won Best Foreign Language Film (Iran). Even though foreign films, different languages, and subtitles are not my thing, I was pleasantly surprised to find out how amazing A Separation is. It is starkly honest in conveying its own culture’s weaknesses, as well as its strengths, and the subtlety of its delivery is very moving. The film opens in a courtroom. A man and a woman, husband and wife, stare directly into the camera as the woman tries desperately to prove that she has grounds for a divorce. Simin (Leila Hatami) wants to take her daughter somewhere out of the country, and she will go with or without her husband. Nader (Payman Maadi), on the other hand, will not leave because his father has alzheimers and he has to care for him. He will give her permission for a divorce, but won’t let her take their daughter. Because Simin moves out, Nader hires a woman to take care of both the house and his father. Razieh (Sareh Bayat) has to bring her young daughter to work every day, as well as commute ninety minutes each way. Although it is clear from the beginning, the arrangement is more to Nader’s liking than Razieh’s, things soon get more serious as Nader’s father’s health takes a drastic downturn and Razieh feels as if her morals have been compromised. Although the beginning is slow, and at first I wasn’t quite sure where the story was going, things eventually took a drastic turn. I won’t reveal what that is, except that the family suddenly finds themselves in the courts again, but this time for a much more serious reason than divorce. The acting is exquisite and almost all of the characters have such a depth and likability that it is hard to root for just one of them. The plot takes some unexpected turns, but also shows a side of Iran that many in the states don’t get to see, which I quite enjoyed. The cultural differences are interesting but are not the driving force behind the film. The story, production design, cinematography, and acting are all forces to be reckoned with, and when it comes down to it, this just might be a foreign film to top the charts. Even if foreign films aren’t your thing (like me! ), I would definitely recommend A Separation for you! You should be aware that it is a drama full of a lot of dialogue (and therefore a lot of subtitles), but I found it completely worthwhile. There is an interesting clash between honesty, religious beliefs, family, and manipulation that pull the whole story together into something great.